Sprint is working with Mobilitie LLC, a Newport Beach, Calif., company to build small cellular antenna systems from California to Massachusetts. 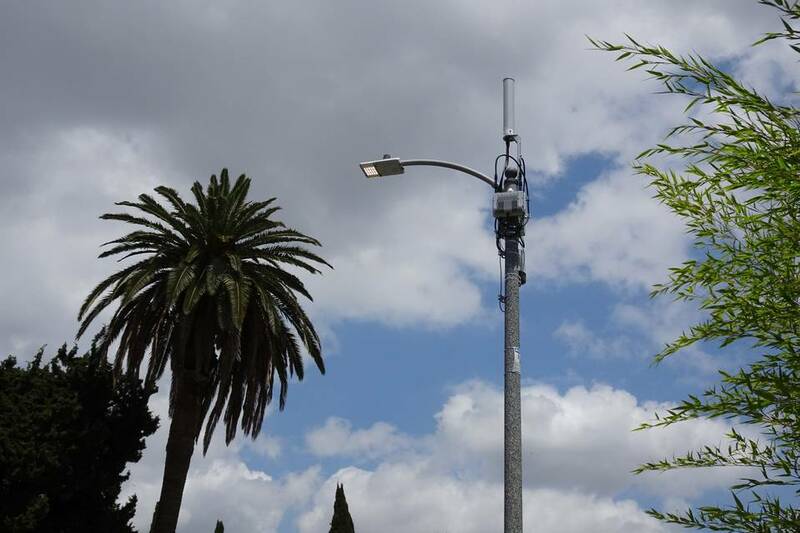 The company wants to install low-power cellular antennas in public rights of way, land typically holding utility poles, street lamps and fire hydrants. In places where it can’t strap antennas to existing poles, it wants to erect new poles. However, the new antenna on poles rollout has been delayed as communities confront what some consider unsightly installations and authorities wrestle with new regulatory questions. Sprint recently slashed its capital spending plans for the year as it waits for zoning approvals. Mobilitie says it has about 1,000 permits approved and will start large-scale installations once more are in hand. In the past, wireless carriers built towers of 200 feet or more that could send signals over large areas to cover as many customers as possible. Now that more people use smartphones to stream videos and surf the Web, carriers want to put lower-power antennas closer to the ground so that fewer people will connect to each one—resulting in less network congestion. “It’s not a new concept,” said John Saw, Sprint’s chief technology officer. “All carriers are trying to ‘densify’ their networks.” But Sprint’s goal is to be “cheaper and faster and more innovative” than its rivals, he said. Mounting antennas on existing utility poles is something most carriers are hoping to do. But cash-strapped Sprint aims to take the concept further than rivals: It is hoping to install as many as 70,000 antennas in the public right of way over the next few years. By comparison, it has 40,000 traditional antenna sites on towers or rooftops. It is a central piece of a strategy devised in early 2015 by Sprint Chairman Masayoshi Sonto improve service while keeping costs down. Companies can negotiate with a city for one deal that includes various permits. Mobilitie Chief Executive Gary Jabara says building and operating these so-called small cells costs about $190,000 over 10 years, whereas a traditional tower costs $732,000 because of real estate rents, power and other costs. The spectrum Sprint owns are ideally suited for this design because their high frequency prevents them from traveling long distances. Rather than string fiber-optic cables to each antenna, Sprint hopes to link them via wireless connections, further bringing down costs and speeding deployment. There’s not enough towers in the country to do what we intend to do to densify the Sprint network, period. So, you’ve got to think differently. And really, there is great benefit around this, because the cost of deployment of cell sites is a fraction of the cost of the deployment of a tower site. So, whatever number you pick up for a tower site, it’s probably $200,000, thereabout, including all-in costs, labor and equipment. 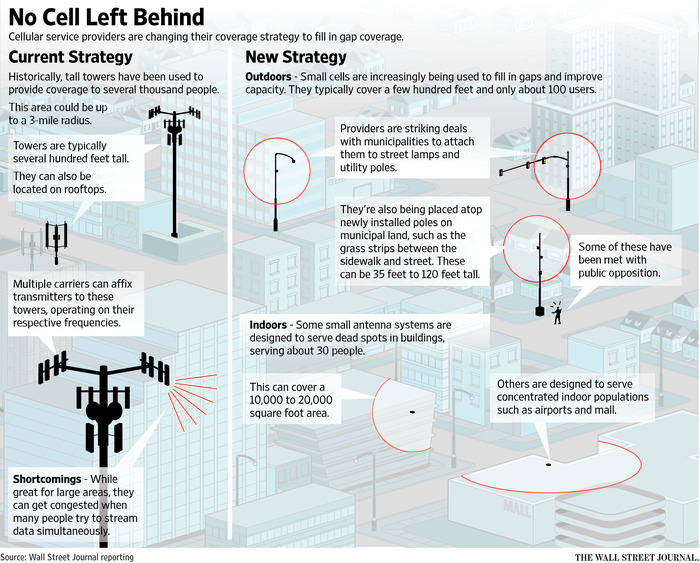 Small cell sites are a fraction of that, 60%, 70% lower. evident, we believe Sprint’s plan to use low-cost commodized small cells and CPE solutions leveraging its vast 2.5 GHz spectrum portfolio will allow it to close the multi-faceted performance gap with competitors in the coming years and achieve positive Free Cash Flow (FCF) while staying within the confines of lower capex guidance. If well executed, Sprint has the potential to become the lowest cost and fastest data network among the national carriers that are migrating to greater dependency on low-cost densification for coverage and capacity using commodity hardware solutions and new (shared) spectrum bands. Majority owner Softbank is highly levered, and investors fear it will be challenged going forward to support its majority investment in Sprint. However, Sprint is benefiting from a change in the technology cycle, leveraging the cloud to nextgen deployment options to spend much less than expected in capital to help generate positive FCF […] There is a general lack of understanding on how Sprint can achieve a 10x increase in downlink network speed at less than half the expected cost and achieve a 30% improvement in network coverage from increasing the maximum power levels in devices, which drives a 30% decrease in cost. Bottom line, existing spectrum in the 2.5 GHz frequency band should sustain Sprint’s improved performance for the next six-plus years […] 2.5 GHz spectrum is the basis of Sprint s LTE Plus network and makes up the bulk of Sprint’s spectrum portfolio. Sprint controls approximately 120 MHz of 2.5 GHz spectrum in 90% of the top 100 U.S. markets. If Softbank can create low-cost Pico and CPE solutions using 2.5 GHz spectrum to densify its network, Sprint will have the potential to become the lowest-cost and fastest data network among the national carriers that are migrating to a greater dependency on low-cost WiFi spectrum ahead of a migration to low-cost, shared LTE spectrum in the 3.5 GHz band and beyond.